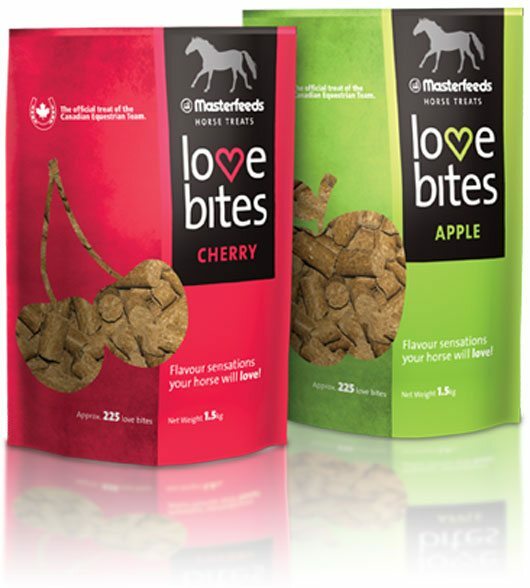 Sales of Masterfeeds’ signature horse treat “Love Bites” continue to soar and have allowed this Canadian company the opportunity to make its third donation of 2010 to the Canadian Equestrian Team bringing its total contribution to $20,000. An official cheque presentation featuring this milestone contribution took place on September 10th during The Masters Tournament at Spruce Meadows. Masterfeeds is the Official Gold Feed Partner of the Alltech FEI World Equestrian Games (WEG), and is engaged in an initiative that benefits the Canadian Equestrian Team. $1 from the purchase of each bag of Love Bites, the Official Treat of the Canadian Equestrian Team, is being directed to the Equine Canada Athlete Assistance Fund. This fund’s sole purpose is to help realize the dreams of many of our athletes — especially those most in need of financial support — to compete for our country. The Games, to be held at the Kentucky Horse Park from September 25 – October 10, 2010, are the world championships of the eight equestrian disciplines recognized by the Fédération Equestre Internationale (FEI). Held outside of Europe for the first time, the 16-day competition involving 600 riding competitors and 700 horses from more than 60 countries is expected to be attended by as many as 600,000 spectators and viewed on television by an international audience exceeding 460 million.